While most children were building race tracks, Lego cities, and sandcastles, Tong Si was really interested in one thing: tearing them apart. Fascinated at a young age by what things are made of, he liked to break things apart to figure out how they work. Si naturally got into biosystems design as a young adult. A CABBI researcher and Carl R. Woese Institute for Genomic Biology (IGB) Postdoctoral Research Fellow at the University of Illinois at Urbana-Champaign, he now uses his lifelong skill set to study micro-organisms such as yeast. Jokes aside, what Si — and the scientists he’s working with at the Center for Advanced Bioenergy and Bioproducts Innovation — are doing is groundbreaking. Si has been at Illinois for nine years — a fact he’s proud of. Si currently works with Saccharomyces cerevisiae — commonly known as baker’s or brewer’s yeast — in the laboratories of Steven L. Miller Chair of Chemical and Biomolecular Engineering Huimin Zhao and James R. Eiszner Family Chair of Chemistry Jonathan Sweedler. 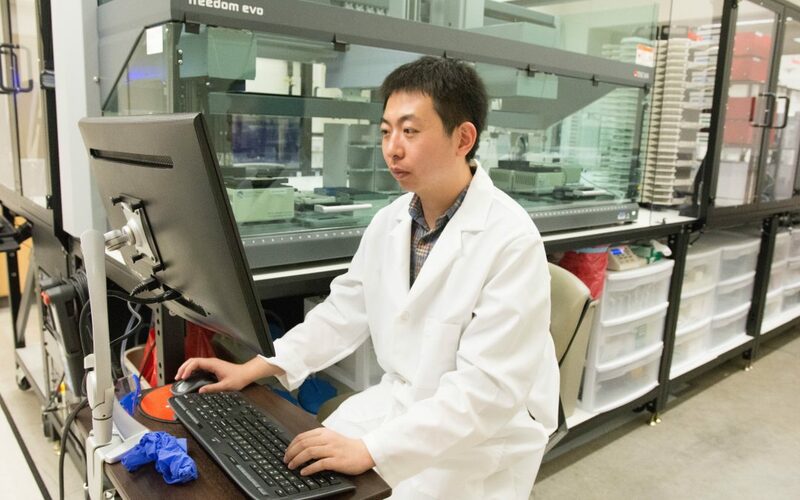 He describes the lab space as a manufacturing plant, except the primary source of labor is a robot doing the work of 50 graduate students, called the iBioFAB, short for the Illinois Biological Foundry for Advanced Biomanufacturing. 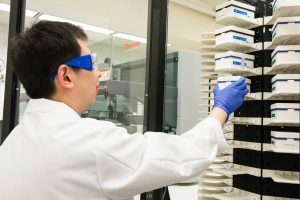 At the “factory,” Si and his colleagues are growing yeast, then breaking it apart to look at it to better understand its genome — and to create a better, stronger microbe. “People are using yeast to produce biofuels and ethanol, but we want to expand and produce more things than just ethanol,” he says. Si has been a part of the Center since it launched in December 2017. CABBI has three themes: Feedstock, Sustainability, and Conversion. Si’s transformative microorganism research fits directly under Conversion. Scientists and researchers working in this theme are engineering living organisms, like baker’s yeast and oleaginous (high oil content) yeasts, in collaboration with other researchers working with plants (sorghum, sugarcane, miscanthus, and others) to efficiently produce more sustainable products such as biodiesel, alternative fuels, oleochemicals, and alcohols. “One hundred years ago, the chemical engineers figured out how to make things and how to make things run. It was great technology, the foundation of our society,” Si says, “but the way we manufacture things like fuel … it’s not sustainable. One part of CABBI is that we are using a natural source to produce, like cornstarch or sugarcane, we want to use something that is inedible, like cellulose from the stems of plants. Si’s engineering has led to developing a baker’s yeast strain that produced the highest concentration of 1-butanol (butyl alcohol, an alternative biofuel) and a yeast strain that exhibited the highest tolerance toward an important fermentation inhibitor — acetic acid. When not altering the main ingredient in one of the most important inventions to humankind (bread), Si relaxes with Netflix and HBO. He enjoys his life in central Illinois, and sometimes it even reminds him of his hometown of Taiyuan in China’s Shanxi province. Next year, he’ll be back home where he hopes to continue his research. His parents are excited, and they’re proud of his work in bioproducts — especially his engineer Dad. “Actually my father is a chemical engineer, so I guess my parents gave me the engineering gene,” Si says.